Dan Meyer is fond of proclaiming that his blog has been one of the best sources of professional development for him. I have to agree that Google Reader is awesome and has contributed greatly to my willingness to go down the path to lighting rural Nicaraguan schools. Here is the question that I have going into this. I have read a lot about teachers being reflective as a starting point for changing their teaching. I know that my friends who are the beat teachers are always asking questions about what they can do to get better. So here is the point. Is it blogging that make you a better teacher or is it just the reflection? I have not been sleeping because I have been worried about physics. What path will the kids take? Will they even want to call Nicaragua and do an experiment with the students there? Will they engage the project like I envisioned or will it be something even greater? As I have finally been writing about some of my feelings I have been feeling better about it all. It is not that it is coming together better, I just feel better about it. But I do not just feel better about it. New ideas are coming at a better pace. New things to tackle in class are coming to me quicker. It is all still messy, but it is messy in a clearer, sort of researched way. So am I joining the teachers for whom blogging has helped them? More likely I am joining the teachers who are reflective researchers of what works in classrooms, and that is making order out of the chaos. So we bounced balls and we modeled the real world with some math. I even had students with graphing calculators out with no prompting. We figured out that we can do the basics of this physics thing. But why would we do this physics thing? I had the students look at this picture for a few minutes. Actually 3.5 minutes exactly. I do this thing where when I give them time to complete a task I open up my iTunes and play a song the length that I give them to work. I even have music sets for longer periods of time. And just in case that is not enough the last song in a set is always orchestral in nature so they know that work time is coming to an end. I asked them to write about the picture. Start with just noticing details and then ask questions about the picture. What do you want to know about what is going on? "In this picture, the first thing that i saw right away was the race of all 7 men. 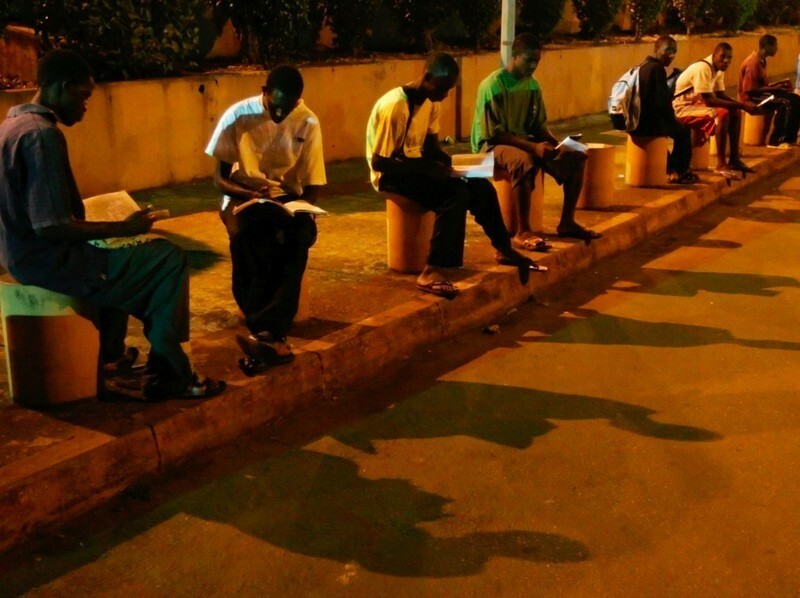 They are of course sitting in the streets and they have notebooks and books with them. As people would get stereotyped into the group as "People who live in the projects, have no future". But looking at this picture made me feel like they wanted to better themselves and better their lives and get an education. That was my first assumption. Also, it looks dark outside, and they are outside reading. I'm not sure if it was night or early morning. If it's the morning, it made me feel like they were maybe waiting for a bus or about to go to school. If it's at night, maybe some of them don't have homes with electricity. So they need light to see what they are reading. Their cloths look rugged and worn. They aren't the newest, yet they aren't the oldest. But as I looked into every each and one of their faces, you can just see the determination and dedication they have to better their lives, and actually have and hold a future, instead of risk themselves surviving without an education for the rest of their life." What teacher needs to say anything when the students bring that kind of heat? What if we brought that to our studies? What if we had a reason to bring that kind of dedication to our studies? The students do not know the question ahead of them yet. The big question will hopefully make their studies this important. And physics is what brings us light today. The first day of school is important. Teachers know this. Dress sharp. Do not show your fear. Smile. Shake hands. move around the room. For years I have lead a physics tour. Student file into the room and the second the bell rings I say follow me, and we go on a tour. I loved this because they do so little on a typical first day in any other class. It screamed we are going to do things in this class. It did not require laptops (which get handed out in English class the first day), pens, papers or anything else. So this year I did not know what to show them. The goal is simply stated, bringing light to rural schools in Nicaragua, but the path is unknown in many ways. What I wanted is to set them up with the reason that this goal is physics. So what is physics? I am not sure. But I do know a few things about it. The week before school I got an email from the NSTA physics list serve. One of the heroes of the list serve is Frank Noschese. He sent this gem to the list as an opening day lab. I've also done a ball bounce challenge. sharing of answers between groups. I hope this makes sense. The data is very linear and is easily collected. I ran with it. Physics is intuitive. Physics uses math without ever really knowing you need to. Physics is real. Physics is experimental. Physics is active on the first day. Who knew that hula-hoops are a seasonal item not available in August? I did not. On my way home the first day (I split the lab across two days) I stopped at 3 stores and called two more. A red piece of tape on the wall had to suffice. I am a big fan of not using paper. I have to admit I am not sure how to duplicate in a technical way these 4 most essential posters created during the curriculum class that I just took. At any time anyone could go over to the poster and write on the wall what curriculum is. It created a space where we as a class opened up our ideas of curriculum. It kept that fundamental questions in front of us all the time.